At these sessions and more, I’m looking forward to meaningful conversations with my colleagues about making museums better. 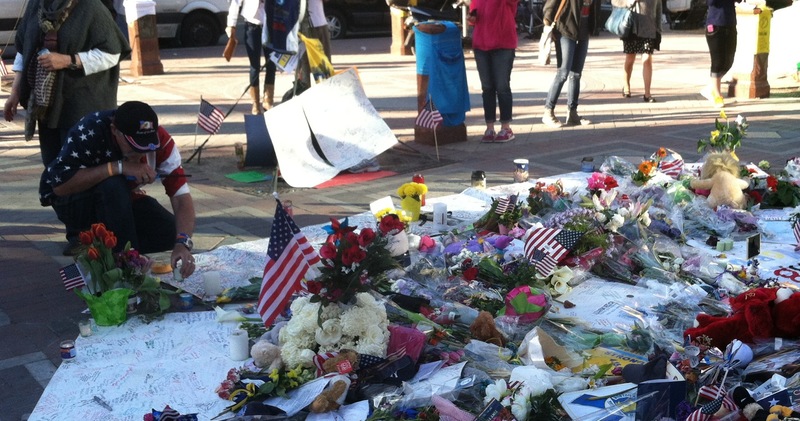 A lot has happened since I wrote my post about the Boston Marathon bombings. It’s time for an update. 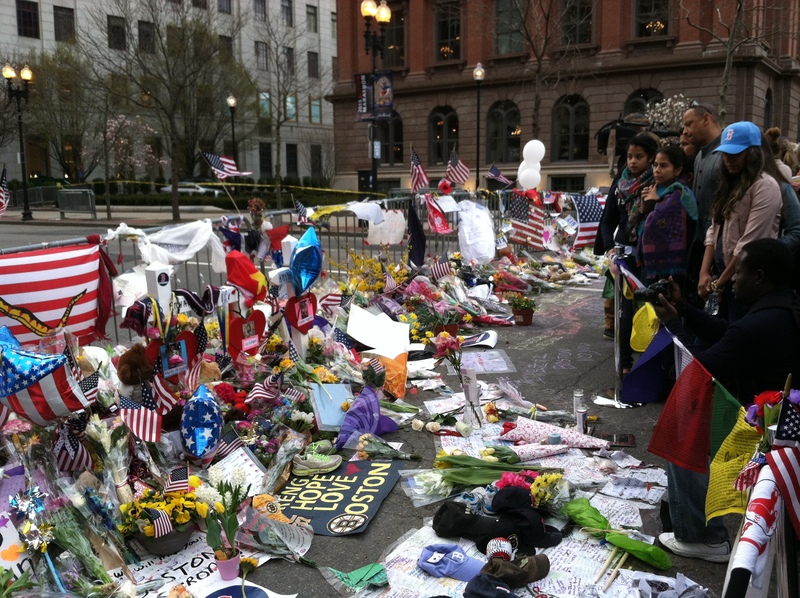 The bombing site reopened to the public on Wednesday, April 22 24, a week ago today. I’ve walked the Back Bay twice since then and found it so very comforting to see people out on the streets. 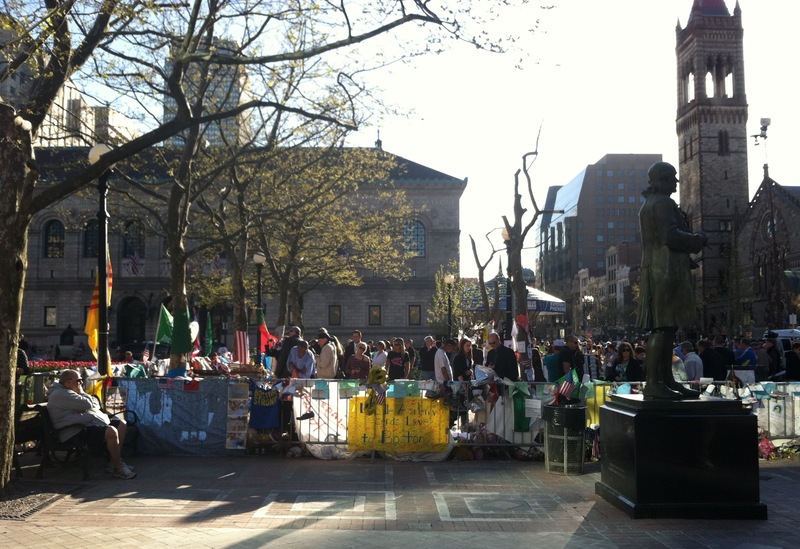 People are the lifeblood of any city, and their absence in and around Copley Square the week of the bombings was even more jarring to me than the sight of soldiers and armored jeeps in front of the Boston Public Library. On both Thursday the 25th and Tuesday the 30th Copley was bursting with people of all stripes—office workers, buskers, skate punks, dandies, tourists, runners, campaign volunteers, dog walkers, moms with strollers. 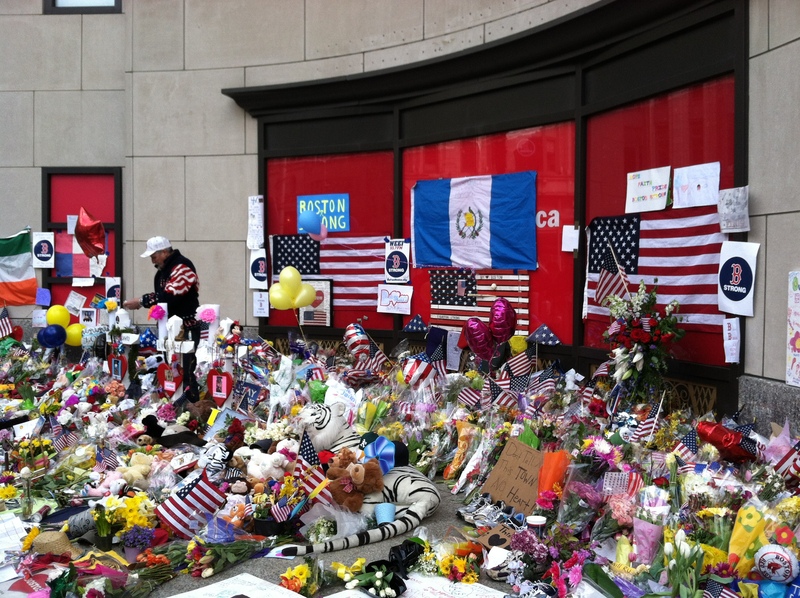 Bostonians are trying hard to get back to normal, sometimes succeeding and sometimes not. On both walks I let myself get lost in the crowd; that’s what normal means to me. Locations 1 and 2 felt cold and hard—nothing but concrete and police barriers against a backdrop devoid of people. By contrast Location 3 feels much more human. It’s a large, U-shaped enclosure on the edge of the Copley lawn, an outdoor room of sorts. Ten of the Copley trees are inside the enclosure, and many of the signs and mementos people have left are propped against their trunks or hanging from their branches, with pathways in between. People are out and about again, and they circulate through the memorial, moving from tree to tree, like visitors at an exhibition. Memorial 3 feels like the right place, a place at the heart of the city. At Location 1 people left their objects themselves, with no particular logic other than where they could find available space. But when volunteers moved everything to Location 2, they organized the memorial. Three white crosses, one each for Lu Lingzi, Martin Richard, and Krystle Campbell, became more clearly the centerpiece of the memorial. Around them, flowers were placed with flowers, stuffed animals with stuffed animals, and shoes with shoes. When the memorial moved a second time, this order was maintained and expanded. As someone who studies cities, I find the most striking addition at Location 3 to be the symbols of Boston’s membership in the global sisterhood of cities—”Istanbul Stands with Boston,” “Stay Strong –Miami,” “Nashville Believes in Boston”—but there is much more. There are several large comment boards people can sign. There are many, many shoes. There is a hat section and a flag section. Which leads me to one of the most important parts of the memorial: its unofficial caretaker, Kevin Brown. He is not the only or the first person to tend the memorial but he has been its most enduring volunteer. A carpenter from Brockton, he has been there during three of my four visits. At Location 1, he and another volunteer were handing out single roses for the children in the crowd to add to the memorial, to give them a way of actively participating in the ritual. 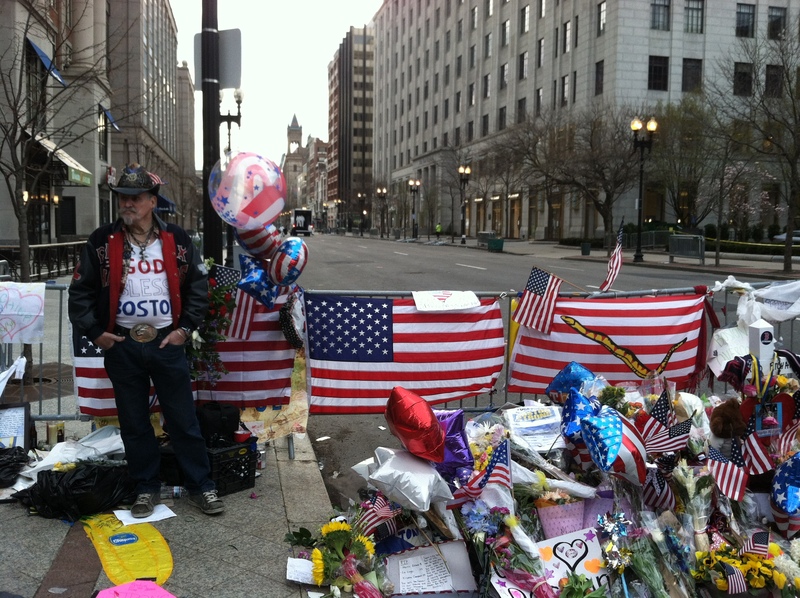 At Location 2, which blocked public access to the memorial much more formally than Location 1, mourners had to pass their mementos across the police barrier for Brown to place, and he obliged repeatedly and good-naturedly, honoring requests for him to pose for photographs, answering questions, and following instructions like “please place this around the neck of the black stuffed dog.” He told me volunteers were organizing that night, in advance of the storms predicted for Tuesday the 23rd, to bag anything that would get damaged by water. He told me some of the marathon medals had been stolen so they had started setting all the medals aside for safekeeping. He told me he watched a female runner walk up to the memorial, take off her shoes, add them to the pile, and walk away barefoot. He told me he was going to make a fourth cross for Sean Collier. Not only was he the citizen curator of Location 2, he was also its docent; guiding people through the mourning ritual. Kevin Brown’s role at Location 3 on Copley Square is different. Because the memorial has grown so big that you can walk around in it, you could miss Brown if you didn’t know to look for him. He has a chair now. I watched him make a round to water all the potted plants, and then another round to light all the candles (it was 6 pm). I was glad to see him. I want to pay particular attention to Kevin Brown because in so many ways he is my counterpart and colleague, even if we don’t really know each other. He quickly and spontaneously took up a role at this memorial that I have trained for and practiced for more than 15 years. While he has been out there in the sun and rain every day, those of us in Boston’s museum and archive community—the professionals—have been moving more slowly. Granted, there are reasons we are moving slowly. The stakes are high when you’re talking about caring for things in perpetuity and we want to do this right (or as close to right as we can). We have indeed made some progress. We have been systematically checking in with each institution in the area, and our list of whether and what each one plans to collect is nearly complete (most notably, at Mayor Menino’s direction, the Boston City Archives will preserve items from the memorial). Historic New England has offered its fumigation bubble to ensure that bombing-related artifacts are pest-free before they are introduced into existing collections. We have made contact with folks at the 9/11 Memorial who have offered valuable advice and ongoing support. We are trying to organize pro bono legal counsel to advise on all manner of issues, from how Massachusetts abandoned property laws will affect collecting to release forms for oral histories. I remain concerned that we still have not identified homes for all of the material that should be collected from this event. 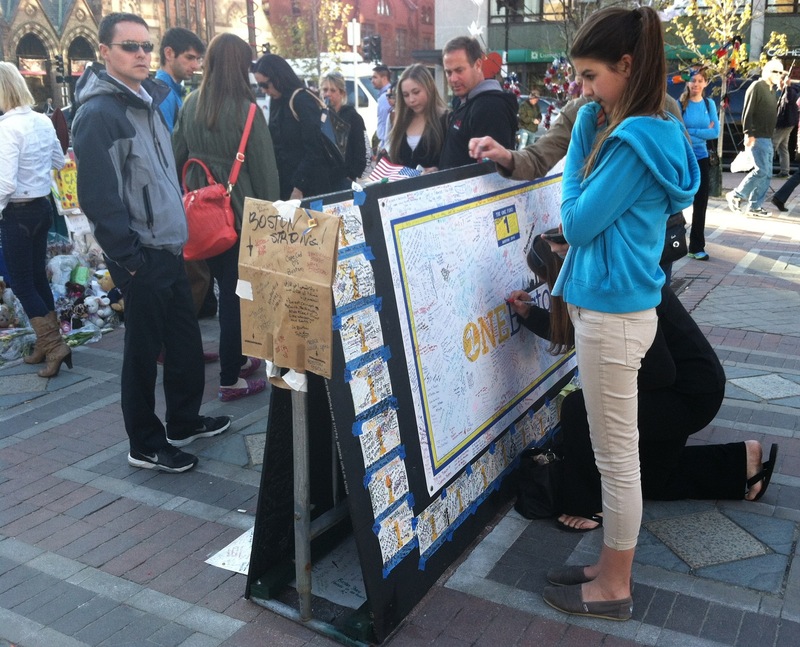 Boston deserves a thoughtful, compelling, and flawlessly executed exhibition of this material on the one-year anniversary of the bombings—to help Bostonians process their emotions and memories and transform them into some sort of positive civic engagement for the city. But there is so much work to be done in order to tell this story—and tell it well—I remain concerned about that too. One thing I am not concerned about is Kevin Brown. This week Kevin Brown is my curatorial hero. This week Kevin Brown is the heart at the heart of Boston. museums, cities, city museums, creativity, culture.